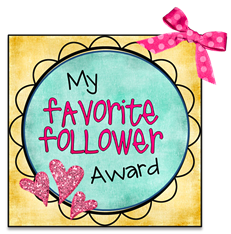 Cindy from For the Love of Kindergarten sent me this Favorite Follower Award. It is hard sometimes to keep up with all the different blog awards, but I love that people follow my blog. So, to keep the award going, I'm passing this along to Cheryl from Crayons and Curls. thanks Cheryl for your blog loyalty and thoughtful comments. I love all of your blogs!! !